You CAN win National Novel Writing Month. "I am a lifetime fan of NaNoPrep! It has helped me progress more in a week than I have in the last year or more... I am loving the method I chose for the outline! It sums up what I want the novel to include, but isn't restricting my creative juices from flowing freely. With each days assignment, my muse is stirring more and more!" - Patrece~So busy!!! The Prep is a month-long, community-oriented challenge that takes place every October, designed to help you plan a novel prior to writing it. 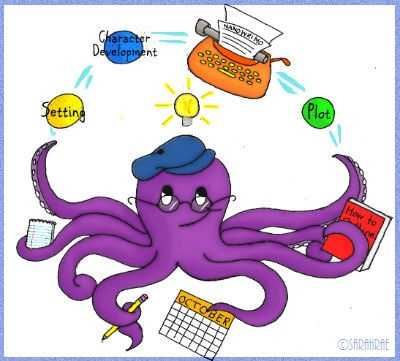 The Prep was created to coincide with NaNoWriMo, but it can be used to prep any novel project. You don't even have to have a novel idea to participate! Your first assignment, on Oct. 1st, is to come up with an idea, and we provide you with brainstorming tools, plot generators, and a whole community of other novelists to help you along. will help you develop your novel-length story before writing it and prepare for the marathon writing of NaNoWriMo . Log your first completed assignment by the end of Oct. 3rd using the Entry Form. You are never required to link your actual writing. Just tell us you finished the assignment. You are on the honor system. To compete in one of the four "Contest Rounds," submit your entry via "October NaNoWriMo Prep Contest Rounds" [E] in addition to logging on the Entry Form for Prep assignment credit. NOTE: You are never required to compete in Contest Rounds or link your work. However, you are still required to complete and log the assignments on Contest Round days even if you choose not to compete. Contest Round submissions may be any rating. Prompts, name generators, brainstorming software and other writing tools are provided but not required. They are simply inspirational tools to get your muse working, since you don't already have your characters, background stories, and settings worked out. Find the writing tools at the bottom of the calendar. The point is to get you disciplined into writing every day, but life sometimes interferes. Therefore, you may work ahead or fall behind and catch up later, so long as you don't exceed 72 hours between logging completed assignments. Exceptions available for restricted internet access if arranged in advance, or for verified natural disasters, so long as you continue to work on assignments offline. Please email Brandiwyn♪ for options. If you exceed 72 hours between posted assignments but still complete all the required work by October 31st, we have a special prize just for you, so please don't give up! The forum may be used for questions, brainstorming about your work, stumbling blocks you're facing, general encouragement of each other, or anything else you would like to discuss related to the Prep, your novel project, or NaNo in general. So that young writers may participate in the Prep, please keep dialog 13+ and below. 1st Place gets a Merit Badge in the genre of their novel. 2nd Place gets 5,000 Gift Points. 3rd Place gets 2,000 Gift Points. an Exclusive "OctoPrep" Merit Badge. participation in the elite "NaNoWriMo Sprint Writers Forum" [13+] during November. access to the life-saving "NaNoWriMo Brainstorming Forum" [13+] during November. Successfully complete NaNoWriMo in November and win a NaNo Winner Merit Badge. Complete at least one Prep calendar assignment by 10/31. Provide your NaNoWriMo author name via the Signup Form.. Your NaNoWriMo account must reflect at least 50,000 words by 11/30. Leader, Writing Coach: K.J. Miller~Camp NaNo Winner! Your Leaders are here to help you, answer your questions, encourage and inspire you, and fix technical problems. Throughout October, we will send out a daily email announcing which participants are still in the running for Merit Badges. Your Cheerleaders are here to motivate you and to reward you for motivating one another in the forum. Our Head Cheerleader will award "Cheerleading" Merit Badges to anyone offering encouragement, whether a contestant or external general supporter. Judge, Contest Round 2: Showering Dutchessbarbie. Judge, Contest Round 3: Mumspie! Judge, Contest Round 4: David the Dark one! Your judges are here to select the winners of the Contest Rounds. Competitors may serve as judges but are not eligible to compete in the Contest Round(s) that they judge. They are still eligible for the Grand Prizes and to compete in the other Contest Rounds. CURRENTLY TAKING DONATIONS. Thank you! Without the support of these generous sponsors, we could not fund your prizes. Donations are always much appreciated. Please send them to Group#1474310. You can also contribute and encourage one another by buying "(de)Motivational cNotes" [18+] or "[ASR] (de)Motivational cNotes" [ASR]. If you would like to help but are not able to donate GPs or time, consider donating one or two of your FREE monthly Merit Badges. They will be required on Nov. 1st and/or Dec. 1st. All you have to do is save them up (don't award a Merit Badge to anyone for 30 days prior), and then coordinate with the Leaders to award a badge to one of our winners on each of the award days. October NaNo Prep Challenge participants. This group houses both your fellow participants and Prep funds. When you sign up, we will automatically add you to the group to receive daily emails. There is no maximum number of contestants, so bring your friends! Sign up using the SIGNUP FORM . See assignments on the "2018 Prep Calendar"
Compete in the "October NaNoWriMo Prep Contest Rounds"
Updates on My Two Third Outline Almost Complete? Re: Re: Re: Round Three Winners!! Re: Re: Re: Re: Most difficult assignment so far? Re: Re: Re: Most difficult assignment so far? Re: A sense of Accomplishment! Re: Re: Round Three Winners!! Generated in 4.10 seconds at 12:36am on Apr 20, 2019 via server WWW1.